Eremulus sp., copyright Biodiversity Institute of Ontario. 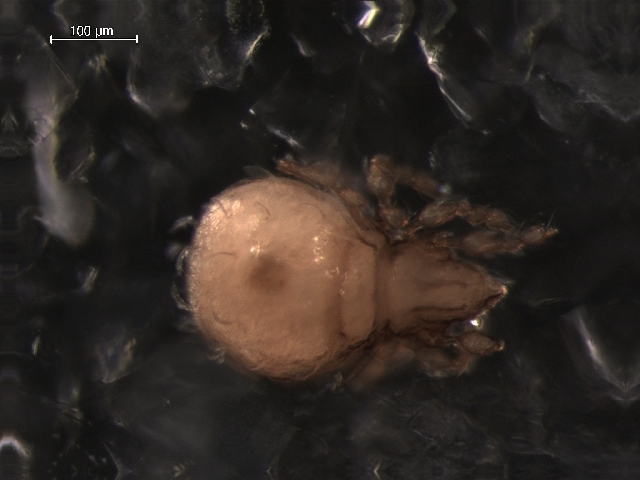 The Eremulidae are a group of oribatid mites most diverse in tropical regions though some species of Eremulus are also found in temperate habitats. Most genera have three pairs of aggenital setae but five are present in the Argentinian Pseuderemulus gladiator and seven in the palaeotropical Caveremulus. Characters (from Norton & Behan-Pelletier 2009): Length 275–500 µm. Gnathosoma normal; chelicerae with dentate chelae, two setae; rutella normally developed. Prodorsum shorter in length than notogaster; true lamellae absent, costulae present. Notogaster with scalps absent; octotaxic system absent; dorsophragamata and pleurophragmata absent. paired opisthonotal glands opening direct on notogaster. Pedotectum I present; propodolateral apophysis absent. Ventral plate setae branched; three pairs of adanal setae. Femora I–IV and trochanters III–IV with porose areas; tibiae and tarsi without retrotecta. [H07] Haq, M. A. 2007. Biodegradation and productivity in tropical ecosystem by oribatid mites. In: Morales-Malacara, J. B., V. M. Behan-Pelletier, E. Ueckermann, T. M. Pérez, E. G. Estrada-Venegas & M. Badii (eds) Acarology XI: Proceedings of the International Congress pp. 137–150. Instituto de Biología and Faculdad de Ciencias, Universidad Nacional Autónoma de México, Sociedad Latinoamericana de Acarología: México.